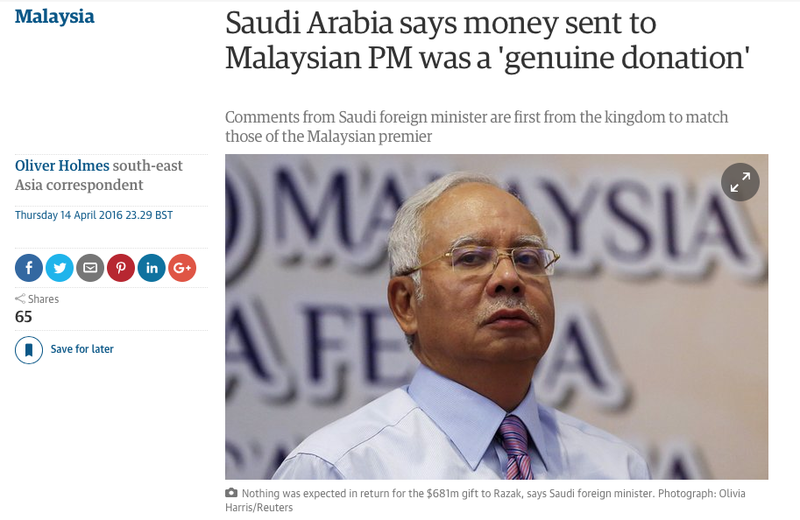 Personally, I have come to the point whereby it does not matter from whom or where the funds originated from either Saudi Royals, SRC or 1MDB. The flip-flop responses from DSN or his "representatives" regarding this fund since the beginning has made it difficult for any reasonable being out there to discern anymore breaking news. You may recall at the early stage that it was a denial. Later, it was "not for personal gain" etc. You may dig up the chronology of excuses given yourself. And now, even the Saudi FM seems to be afflicted by the 'flip-flop flu'. My main concern is more on the legal implication vis-a-vis Section 3, Section 16 and Section 23 of the MACC Act 2009. Those sections of the Act touch upon "public officer". Since the highest public officer of the country has shown to disregard the law which was passed by the august house and later endorsed by the King henceforth, do not expect ordinary citizen to be law-abiding as well. I believe the aforementioned Act was not drafted by WSJ or Sarawak Report. Eh, Latuk, even if this report was genuine, which I don't believe it is, what happened to the SRC "donation" and the billions siphoned off to the wrong Aabar ? We are no longer talking about 2.6 billion, we are talking about 4.1 billion !! 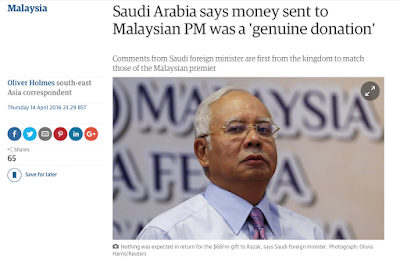 I think the best to solve the RM2.6 donation is through a diplomatic note issued by Saudi Arabia to the Malaysian government, with a hope that it will able to clear the air once and for all. Quoting a news report will not proof anything. If it is not called "donation", what else. Payment for some lands purchase? Repayment of debts? The issue is the source of such big amount. From 1MDB or what? If I stole some monies from Tabung Masjid and I gave it to the Tok Imam to spend on building toilets at the mosque, I will call it "donation". Tok Imam will also call it "donation". But the fact is that the money comes from a criminal activity and it's haram in Islam.. The same man in Feb said that there was no donation but it was a business deal. Seems like he has been afflicted by the 1MDB disease. Keep changing your story to suit the circumstances. Yang salah jika penjawat awam menerima imbuhan dari luar dan dimasukkan ke dalam akaun peribadi. Tak kira la sapa penjawat awam tu. Tak kira la berapa banyak imbuhan tu. Tak kira la untuk apa imbuhan tu. Tak kira la untuk sapa imbuhan tu. Memang dah salah. Pusing2 mcmana pun, tetap salah.